London’s tallest building, The Shard, officially opened today to great fanfare. It is currently the tallest building in Europe at 310m high (1016 feet). It will retain the tallest in Europe title until the end of the year when The Mercury Tower in Moscow will be completed. This will be 327m high. By comparison, the The Eiffel Tower, which is not classified as a building, is actually taller than the Shard at 320m and its observation deck is also 31m (100 feet) higher than the Shard’s one, at 276m. 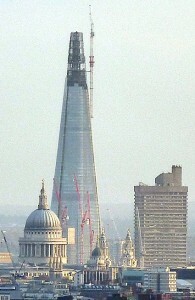 Despite being the tallest building in Europe, The Shard is only the 59th highest building in the world, see link here. But this official measurement of a buildings height is a measurement to the top of a buildings spire i.e to the point of the highest architectural detail. Many buildings add large spires to enhance their height but which are largely decorative only. The Shard is guilty of this as well, as its highest floor, its observation deck is 245m high. In my opinion a more honest approach for measuring the height of a building is to measure to the highest usable floor. If this criteria is used than The Shard is currently the 39th highest building in the world. This is quite a lowly position for the highest building in Europe. Interestingly London city itself occupies nearly the same position, as The Shard’s floor height position does, in an international list of cities with the most tall buildings, i.e. over 100m in height. In this case London is in 38th position in the world with 41 buildings over 100m in height. The UK’s former colony, Hong Kong, occupies top spot in this ranking with an amazing 2,354 buildings over 100m in height, this is more than 3 times the number of buildings in New York over this height. Size Envy. A good example where developers have tried to enhance a buildings status by the use of a spire is the Q1 building in the Gold Coast in Australia. This building is deemed to be the tallest building in that country as its highest point is 322.5m (1,058 feet) high. But this includes its rather tall and thin spire. In fact its highest floor is actually 235m high, or over 100m lower that the spire height. As a result in my opinion Melbourne’s Eureka Tower should be considered Australia’s tallest tower as its highest floor is 292m high. Numerous other examples around the world can be highlighted also, but probably the most famous example of ‘this enhancment’ are the Petronas Towers. Note: Image of the Shard above taken from http://www.hampstead-heath.org.uk.